Venting the gas emitted by hot brake pads improves overall brake performance and helps minimize fade. Power Slot Power Alloy Brake Rotors are specifically designed to run cooler. In fact, all applications have superior metallurgy and design specifications, including vane designs (with some applications featuring curved vane designs) to further promote cooler running temperatures. And the Power Slot Power Alloy Brake Rotor's slotted design dramatically improves wet and dry brake performance and is a safer alternative to drilling crack prone holes through cast iron rotors. The slotting process removes far less of the rotor's surface area than conventional cross drilling to help maintain the highest possible co-efficient of friction for the brake pads to work against thus increasing initial "bite." Slotted rotors trade only 3.7% of their surface area to the slots that vent the gasses, while drilled rotors sacrifice up to 7. 75% of their surface area, and rotors that are both drilled and slotted sacrifice up to 9.38% of their surface area. Less surface area means less stopping friction. The rotors are also double disc ground and mill balanced to ensure a consistent friction surface and improved pad bed-in. The short slot designs of Power Slot rotors run perpendicular to the vane to preserve rotor strength and are angled to use the rotors' direction of rotation to enhance performance. This makes them side-specific with left side (driver's) and right side (passenger's) rotors. Power Slot Power Alloy Brake Rotors' black Electrocoating (E-coating) finish, an electrostatically applied finish is designed to withstand 400 hours of saltwater exposure without rusting and provides long lasting corrosion protection in the critical hat and cooling vane areas. Select applications also benefit from Power Slot technology that results in a completely engineered performance rotor with superior resistance to cracking due to thermal stress. 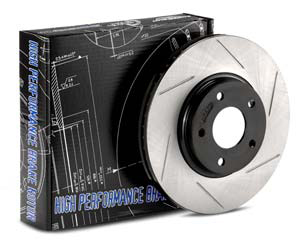 These specific rotors' increased molybdenum (higher carbon) content further extends reliability, longevity and helps reduce NVH "noise" issues. Designed to beat the challenges of high performance driving and severe duty brake demands as well as to enhance open wheel designs, all Power Slot Power Alloy Brake Rotors represent one of the most cost-efficient performance brake upgrades offered in the market today.